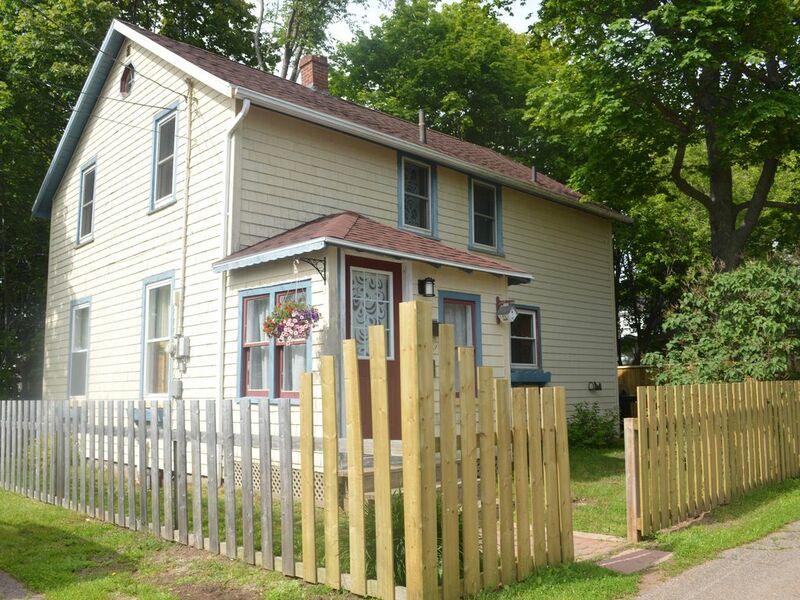 Situé à seulement trois pâtés de maisons du centre-ville de Charlottetown, le 26 Gerald Street est une maison de 117 ans qui a été entièrement rénovée tout en conservant son caractère et son charme. Niché entre les arbres sur une rue calme (connu pour les résidents comme "La Voie"), cette maison possède un mélange de bon goût de meubles anciens et les nouveaux. Situé au premier étage est un sunporch, salon, salle à manger, cuisine et poudre / buanderie avec lave-linge à chargement frontal et sécheuse. Portes françaises séparent la salle de salle à manger et le salon. Le salon dispose d'un 50 pouces LG TV avec le câble et Internet sans fil. Une cuisine complètement mis en place contenant tous les plats et les appareils que vous avez besoin pour rendre vos vacances agréables et divertissants un plaisir. Situé au large de la cuisine est une petite terrasse avec un barbecue et une salle à manger. Le deuxième étage a trois chambres, deux avec lits queen et une avec un lit double. La salle de bain principale est à l'étage et est exceptionnellement grand et lumineux. Les épiceries, les magasins d'alcools, les pharmacies, les arrêts d'autobus et de nombreux restaurants sont situés à quelques pâtés de maisons de cette zone résidentielle. Explorez la ville à pied! Pas de voiture nécessaire. Situé dans le quartier historique Upper Prince, 26 Gerald est entouré par quelques-unes des maisons les plus anciennes et les plus belles à Charlottetown. Terrific property in an excellent location. The house is very very nice and well appointed. Felt like home immediately. The location is excellent, great walking and close to everything you need. The hosts were very helpful. Great place to stay in Charlottetown! My wife and I loved our stay at 26 Gerald St. First of all, Bobby and Kathy are wonderful hosts. They thought of everything to make our stay comfortable and memorable. Paper goods, K-cups, laundry detergent, spices, towels, shampoo, etc etc were all included. The house itself is beautiful. My wife and I both loved the layout and everything was clean and neat when we arrived. Bobby and Kathy would come by regularly (we were there for a month) to water plants and mow the lawn and take the trash. The location is perfect! It's an easy walk to downtown and the waterfront as well as to the grocery store, restaurants and the liquor commission. The Confederation biking Trail is just a few blocks away as is UPEI. The neighbourhood is very quiet despite being close to University Ave. Our dogs loved the fenced in yard and we could leave them outdoors without fear of them escaping. One of our favourite pastimes was sitting on the back deck having our morning coffee enjoying a cool PEI morning. My only regret is we weren't able to stay longer! We highly recommend 26 Gerald St. and look forward to returning again next year. Feels like home away from home! A couple colleagues and I were in from Colorado, USA for a work trip, and Bobby and Kathy's place couldn't have worked out better. The whole house was well-stocked with everything we needed for a homebase away from home. Both Bobby and Kathy returned our inquiries quickly and thoroughly, and Bobby even dropped by a few parting Pilseners before I flew out the next morning. Also the house was centrally located, making it very easy to navigate around Charlottesville. Next time I hope to travel out there on vacation with my wife! We had a very enjoyable holiday. Kathy and Bobby are very attentive and generous host's. We were met when we arrived and found their home well equipped and very clean. Locating it was simple and the location is great. The house is within walking distance to stores and restaurants. The waterfront is easy to locate and getting out of town was a very direct route. We enjoyed the week spent and this home made it a great spot to end our busy days. Thank You!